THE CONCERT IN SAUK CENTRE FOR THE JERSEY TENORS ON THURSDAY, 4-11-19, 7:30 PM, HAS BEEN POSTPONED DUE TO WEATHER. The excitement of live music, theater and dance is a memorable experience you and your family will value forever. Enjoy great live entertainment suitable for all ages without trekking to a larger city. The Centre Area Concert Association provides big city entertainment opportunities at a small town price. The season is usually September through May. 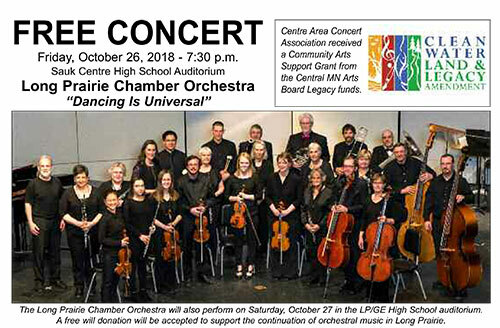 Our area is fortunate to have a concert series that is made possible by the donations of its sponsors, the subscriptions of its members, and by the dedicated volunteer work of local campaign workers. This civic undertaking ensures the continuing success of our priceless cultural assets and enriches all of our lives. The Centre Area Concert Association would like to thank this season's corporate and business sponsors, along with all of the contributors who give so generously to our organization. Please support these businesses as it is through their continued support that we are able to provide quality programming and make a difference in our community.